Traditionally identified as the Emperor Commodus, the bust portrays an unknown private citizen of the Marcus Aurelius period (160-180 A.D.). The quality of the Portrait Bust of Commodus is self-evident for the bold chiaroscuro contrast between the luminous surfaces of the face and the densely drilled mass of hair and beard. The sculpture shows a remarkable structural solidity and an expressive intensity, representing at its best the characteristic private portraitures of the late Antonine period. Restoration has restituted full readability to the delicate shades by removing the thick layers of soot, wax and dust that over the decades had dulled the powerful plasticity of the sculpture. Incoherent layers of dust were removed with soft-bristled brushes, and cotton swabs soaked in deionized water were mostly sufficient to remove superficial dirt. For more encrusted deposits chemical solvents were used. 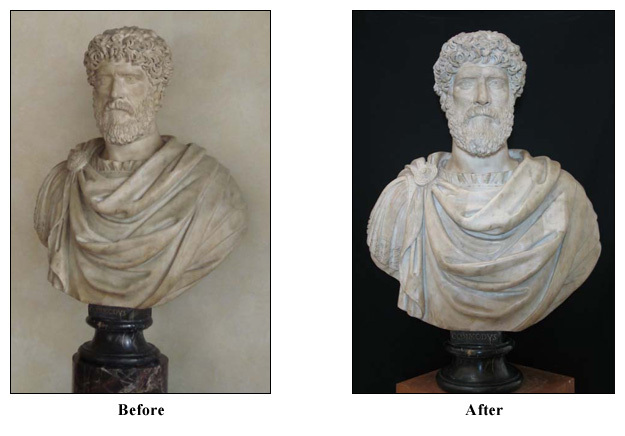 At the end of the cleaning stage the old putty between the ancient head and the restored bust was removed, and a new mixture of lime, marble dust and acrylic resin was applied. Finally some retouching with watercolor reduced the more evident chromatic contrasts between the ancient and modern parts of the bust.